Wait, what happen to the Flower Girl in Final Fantasy VII? This article is filled with SPOILERS for the Final Fantasy VII game. If you are like most of us then you were stunned when that evil metrosexual Pantene hair commercial by the name of Sephiroth kills our beloved flower girl Aeris at the end of disc one in Final Fantasy VII. We spent hours searching the area where she died trying to find a way to bring her back to life not knowing even if it was possible. Aeris was so well liked that the rumors began instantly that there was a secret way to bring her back. 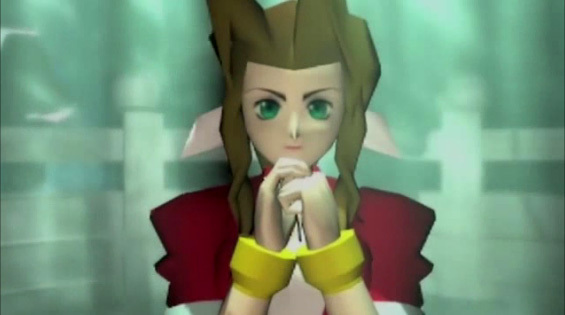 The rumor has not just been around because of her popularity, Aeris has also appeared in Final Fantasy Tactics, Kingdom Hearts and the Final Fantasy VII Advent Children Movie fueling the myth even years after the game was released. Pop Fiction on GTTV filters out the rumors and finally gives us an answer to one of the biggest gaming myths out there still and puts the question to rest, until the HD remake of course!